Are you ready for an evening of Halloween fun within the walls of historic Sutter’s Fort? This Saturday you can stroll the courtyards and rooms of Sutter's Fort by moonlight for an after-dark spooky experience. Plus, B Street Theatre will be back again with an all new original 8-minute play inspired by the history of Sutter’s Fort. Ticket holders are welcome to arrive anytime after gates open at 6:30PM, but please select your Haunted Fort tickets based on which B Street Theatre performance you would like to attend. Show times are: 7PM, 7:45PM, 8:15PM and 9PM each night. — Friends of Sutter’s Fort Members receive advanced access to discounted tickets. — Children 4 and under free! This Saturday is also the 2nd Annual Rocktoberfest at Two Rivers Cider Company. The family-friendly festival features local musicians, a haunted alley, costume contest, and of course cider. 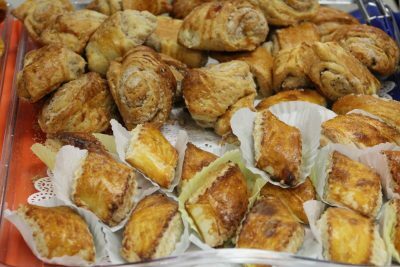 The longest-running food festival is celebrating 71 years of sharing Armenian food and culture on Saturday. And this is the ONLY time of year you can sample fresh, authentic Armenian cuisine. Traditional lunch begins at 11, entertainment for the whole family at noon, and dancing to follow.